While lazing in the heat of the sun yesterday I found myself thinking remembering the first stanza of a poem from childhood. It's in my very tattered copy of A Child's Garden of Verses. I had to look it up when I got home because I couldn't remember the rest of the poem. I also like the poem Warm Summer Sun by Mark Twain. Do you have a favorite sun poem? So, your challenge is to write a sun poem. Leave me a note about your poem and I'll post the results here later this week. If you are a fan of Scholastic Teacher Guides, then you won't want to miss this sale. Until May 31st you will find more than 500 e-books on sale for $1.00. Yup, you heard that right--only $1.00! Are you doing a happy dance? I am! If you are looking for poetry resources, you'll find titles by Betsy Franco, including Counting Caterpillars and Other Math Poems and Graphic Organizers for Teaching Poetry Writing. There are 125 titles for math, ranging from grades preK through middle school. There are also titles for social studies, science, language arts, and more. You can preview any title before making a purchase. For more information and to search for resources, check out the Scholastic Teacher Express - Dollar Days site. First Day of Math - Let's Start With a Puzzle! Summer school begins tonight. Two nights a week for three hours each night I will be teaching preservice teachers how to teach math. This is perhaps my favorite class to teach. I get folks who are often quite nervous about taking a course with the word math in the title and have just eight short weeks to develop their confidence in and love for a subject for which many willingly express a dislike. Hey, I love a good challenge. Unlike many instructors, I do not begin by handing out the syllabus or even by giving introductions. I ask students to clear their desks and then working in teams, I give them a math problem or puzzle to solve. In past semesters I have started off with tangrams, attribute block trains, and pentominoes. The puzzles they solve are challenging. I ask them to keep a list of all the math concepts and skills they are using while working towards their solutions. It may sound odd, but I want them jump headfirst into thinking mathematically and realize quickly that they need to become comfortable in their "mathematical skin." I also need them to understand that to teach math they need to know math--really KNOW math. In fact, this is how my syllabus begins. You cannot teach what you do not know. There is a large body of evidence from which educational researchers have concluded that the quality of teacher subject matter knowledge directly affects student learning. Nowhere is this more apparent than in the teaching of mathematics. We also know that “a teacher’s subject matter knowledge of school mathematics is a product of the interaction between mathematical competence and concern about teaching and learning mathematics (Ma, 1999).” As a result, this course is focused on developing your mathematical competence so that you will not only know the mathematics you will teach one day, but also feel utterly confident in discussing and explaining it. It is only AFTER they get this message that I hand out the syllabus and allow introductions, though having started with a group task they have already begun to know one another. So, what task am I starting with today? This time around I'm going with some Kakuro puzzles. Like Sudoku, the object of filling in a kakuro grid is to fill the boxes with numbers so that no number is repeated in a column or row. However, kakuro puzzles are based on finding sums. Here is what one looks like. After introducing the puzzle and explaining the rules, I solve a sample problem with them and model strategies. Then they are given a few problems to solve with a partner. If you are interested in trying some kakuro puzzles yourself, here are a few useful resources. When students get to work, I get to observe. What will I learn about my students by listening and watching them solve puzzles? A lot! I will learn how flexibly they think. I'll learn something about their number sense. I'll learn how they approach problem solving and something about their ability to deal with a challenge. I will also learn how well they work with others, what their mathematical discourse sounds like, and a whole lot about their feelings towards math. I'm quite fond of the articles published at the Poetry Foundation web site. In the article Again! Again! by Sonia Levitin, she says the following about poetry. As adults, we’ve learned to turn to poetry to mark an important occasion: a wedding, a death, a graduation, the birth of a child. Poems are large enough to capture the emotional richness of the event. But I think we forget that poetry is also large enough to encapsulate everyday experiences—and children’s poetry does that so well: the wonder of seeing a caterpillar wind its way across the sidewalk, the birth of a butterfly, the beauty of a pansy, the taste of maple syrup. Children’s poems take for their subjects every possible relationship, training the heart and the mind to savor and pay attention in a language that a child can understand. I love the fact that poetry pays attention to the everyday and makes the ordinary extraordinary. Since I reviewed a book on eggs today, that's the subject that is stuck in my mind. So let's write about eggs. Leave me a note about your poem and I'll post the results here later this week. The eNature blog had an interesting post last week entitled Why Do Bird Eggs Vary In Shape and Color?. That and a trip to the lake to watch the baby goslings got me thinking about egg books. It's a room with no view. It's walls to break through. It's breakfast, lunch, and dinner. It goes on to discuss how all animals need to make more of their own kinds, and that while some animals give birth to live young, many animals lay eggs instead. Eggs are described as special worlds that provide everything a developing embryo needs to grow, from food and drink to oxygen. But embryos need more than this to survive. They need a hospitable climate, meaning they must not freeze of overheat. Singer goes on to describe the texture, shape, size and color of eggs. Readers learn about how many eggs different species lay, how they're protected by parents, nests, or both, and how they hatch. Emma Stevenson makes her debut as a picture book illustrator with this book and it is a beautiful first effort. The gouache paintings are finely detailed and offer a visual treat to accompany the text. The book ends with a extensive series of notes, including information on protecting eggs, a glossary, source notes and wildlife organizations. A comprehensive index is also included. I learned several new facts about eggs while reading this book. Here are a few of them. Bird eggshells are always hard, but their texture varies? Some eggs feel soapy, while some are powdery. A flying fish's eggs have long threads to catch on to seaweed so they won't float into dangerous waters? A termite queen may lay as many as a billion eggs in her lifetime? Overall, this is an informative and thoroughly engaging book. I highly recommend it. Source of Book: Personal copy purchased from a local independent bookstore. 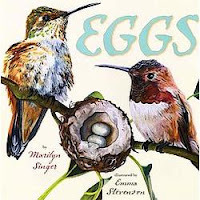 If you are interested in some other books about eggs, check out my thematic book list on spring life that focused on eggs and life cycles. This review was written for Nonfiction Monday. Head on over to Great Kid Books and check out all the great posts highlighting nonfiction this week. I've been thinking about time lately. Perhaps it's because I'm reading THE PHANTOM TOLLBOOTH ("As you can see, that leaves almost no time for brooding, lagging, plodding, or procrastinating, and if we stopped to think or laugh, we'd never get nothing done.") yet again. Or maybe it's just that as another school year comes to an end, I'm wondering where the time is going. So, as I'm thinking about time, here's a bit of E. E. Cummings that seemed appropriate. The round up is being hosted by the amazing Julie Larios at The Drift Record. Do stop by and take in all the terrific poetry being shared this week. Before you go, be sure to check out this week's poetry stretch results. Happy poetry Friday all! So, if you are interested in online stories well told, take a look at the Online Storytime channel at Barnes and Noble. I'm quite fond of the poems in Linda Sue Park's book Tap Dancing on the Roof: Sijo Poems. Her sijo are full of little surprises. One of my favorites is entitled Long Division. It is the poem that gives the book its title. Another favorite is the poem below. You can read some other examples of sijo at the Sejong Writing Competition. How do you write a sijo? Here is a brief summary of the advice Park gives at the end of her book. The first line should contain a single image or idea. The second line should develop this further. The last line should contain the twist. So, your challenge this week is to write a sijo. Leave me a note about your poem and I'll post the results here later this week. I love books that explore science and history from different perspectives. For example, I love the notion of learning about animals not by the groups they belong to (say a book on birds or reptiles), but by some common feature that links them together, as in Venom by Marilyn Singer, or Living Color by Steve Jenkins. One of my favorite history books looks at how salt has shaped our world. No, this isn't a straight chronology, but rather a book that examines historical events through the lens of a very important substance. One could easily imagine a book written about tea, or silk or gold in this same fashion, but being the science lover that I am, I loved learning about salt. I learned of this book only after reading Salt: A World History by Mark Kurlansky. The Story of Salt is a kid-friendly version of this work. 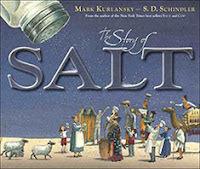 In it, Kurlansky shares the history and science of salt. Here are some interesting things kids will learn while reading this book. Salt is the only rock consumed by humans. Salt paid for the Great Wall of China. Roman soldiers were often paid in salt. When the Jamestown colony was started, a saltwork was established. Ghandi walked 240 miles to the sea to defy British law and make salt. Today, the US is the world's largest supplier of salt. This well-written and fascinating text is accompanied by color-washed pen-and-ink drawings that add humor and interest. The book ends with a timeline of salt through the centuries. Overall, this is a well-researched piece that deserves a place on your bookshelf. This review was written for Nonfiction Monday. Head on over to Simply Science and check out all the great posts highlighting nonfiction this week. Monday Poetry Stretch - What Month Inspires You? I was born in August, but it's not my favorite month. It's always too hot and it seems to linger unnecessarily when I just want to get back to school. I love fall, but am not a fan of Halloween. January reminds me of the blizzard of '78 and snow, snow snow. Why am I thinking about the months of the year? Largely because I've been working on a collection of poems about the seasons (more scientific than holiday-oriented) and I've been trying to think about the months in different ways. So, now I'm writing poems about the months. Won't you join me in writing about your favorite month or a month that inspires you? Leave me a note about your poem and I'll post the results here later this week. First, let me shout it from the rooftops, MY GRADES ARE DONE! Phew! The semester is officially over and graduation is this weekend. I really wanted a celebratory poem, but I read this one and couldn't get it out of my mind. The round up is being hosted by Terry at her new blog, Family Bookshelf (once known as Scrub-a-Dub-Tub). Do stop by and take in all the fine pieces being shared. Before you go, be sure to check out this week's poetry stretch results. Happy poetry Friday all! The challenge this week was to write a rhopalic verse. This form was not for the weak-hearted. Here are the results. TeacherDance shares a poem about trees. The last poetry in the classroom entry was a thematic list of books on poetry for kids. In it I included the book Fly With Poetry: An ABC of Poetry, written and illustrated by Avis Harley. I love this book because it often gives me inspiration when I want to try my hand at writing in different forms. This week I want to try rhopalic verse. Here's how Avis defines it. So, your challenge is to write a rhopalic verse. Leave me a note about your poem and I'll post the results later this week. Thirty days of poetry posts have come and gone. I always embark on an April project and then about a week in wonder exactly what I've gotten myself into. I desperately needed to get back in the blogging habit, and these poetry posts were my kick start. I still didn't get to every book, poet, or theme I hoped, but still feel pretty pleased with what I did cover. In case you missed one or two or more, here are my April poetry posts. Instead of simply listing by date, you'll find them grouped thematically. 13 - Food, Glorious Food! Thanks for joining me for the ride. It's been fun.